Todays satellites support a wide range of civilian and military applications, including televisions, cell phones and Global Position Systems (GPS). As demand for these applications increases, the satellite industry must continue to innovate to provide faster, more efficient, and more cost-effective service. Instead of deploying large, complex geosynchronous satellites, the industry is moving to constellations of smaller satellites flying in formation. These smaller satellites provide the same functionality as their bigger predecessors, but are less expensive to build and launch. Mr. Stanley O. Kennedy, Jr. serves as the Vice President & General Manager, Commercial, Civil, International (CCI) Programs for Comtech AeroAstro, Inc. In this role, Mr. Kennedy is responsible for executing all CCI program activities to include Space Systems and Space Product development. Prior to this appointment, Mr. Kennedy was Vice President and General Manager, Programs for Comtech AeroAstro, Inc. Mr. Kennedy has 26 years of hands-on experience in aerospace engineering; his extensive small satellite, launch vehicle, upper stage and ground systems experience coupled with mission domain knowledge in military, intelligence, civil and commercial markets supports Comtech AeroAstros development of innovative solutions for key customers. Prior to joining Comtech AeroAstro, Mr. Kennedy held senior leadership positions developing innovative small satellite systems and concepts for Lockheed Martin Space Systems Company and General Dynamics Advanced Information Systems. Mr. Kennedy is an Associate Fellow and lifetime member, since 1983, of the American Institute of Aeronautics and Astronautics (AIAA). He is currently serving as the Technical Chairman, AIAA/Small Satellite Frank J. Redd Student Design Competition, Utah State University, Logan, Utah, and is the Aerospace Industry Association (AIA) Space Trade & International subcommittee chair. In order to tackle the ever increasing problem of interference, GVF established a global VSAT Installation training program, which has proven extremely successful, with many operators now promoting and sponsoring the initiative worldwide. The Satellite Interference Reduction Group (sIRG) has been focusing a great deal of its effort on helping to promote this worthwhile initiative. Conversations with David Hartshorn, GVFs Secretary General, and Martin Coleman, Executive Director of sIRG, have obtained their insights into the initiative and the problems surrounding satellite interference. Hailed as a game changer in some quarters for the way we interact with stories and brands, Transmedia is gaining prominence as a concept and technique for producers to engage with consumers across multiple connected devices. It is a logical extension of ideas such as cross platform and 360-degree production but its roots lie decades back, albeit in other guises. Stories were extended onto different platforms for Star Wars where it was mostly seen as a marketing and merchandise exercise. Now the web allows the audience to immediately feedback their thoughts to writers and producers  the audience becomes a participant in the storys creation. The prolific use of LANDSAT opened a market for better resolution. And a little more than a decade ago, Space Imaging and DigitalGlobes QuickBird hit the one-meter threshold. As the next generation of commercial satellites pushed the resolution to a half meter, technology improvements  driven in part by GPS devices  made accuracy the next imperative. 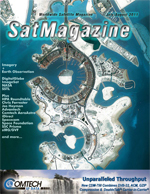 Focus On EO + Imagery: Rani Hellerman on Geospatial Information: Managing Our Future, Director of Business Development, ImageSat International Ltd.
A formative decade has passed, during which the civilian high-resolution satellite data business has reached a critical level of maturity. The timing is auspicious, as the industry applies itself to the growing challenges of managing our world and its resources. ImageSat International is playing a key role in this trend. Though our planet has long reminded us of its dynamic, unpredictable, and forceful nature, the past 18 months have been particularly painful for human civilization. It seems like one global disaster has followed another, with dire consequences for millions of people. Surrey Satellite Technology Ltds Disaster Monitoring Constellation is a fleet of small low-cost Earth observation satellites, but despite  or because of  that fact, it has undergone rapid evolution in the last decade, a process set to accelerate further in the next few years. The perfect is the enemy of the good is a saying that should apply to space as much as anywhere else. Except that designers of standard space missions aim for as close to perfection as they can get, with exhaustively-tested space-qualified parts serving as the basis of multiple-redundant subsystems. The ensuing satellites promise to operate optimally for years on end  but such performance comes at an astronomical cost in terms of mass, complexity and time as well as cash. Not to mention the top-of-the-range launchers needed to fly such heavy payloads (the launch typically amounting to upwards of 40 percent of mission costs). The U.S. Geological Survey (USGS) now has almost 40 years of archived data of the Earths continental surfaces obtained from the Landsat program to support global change research and applications. This data, which has been supplemented by some pre-Landsat military programs, constitutes the longest continuous record of the Earths surface as seen from space. These millions of images have been distributed throughout the world for use in a wide range of disciplines, including global change research, agriculture, cartography, geology, forestry, regional planning, surveillance, education and national security. The satellite industry has just completed its quarterly reporting season, and theres little doubt that the FSS sector is in great shape. Satellite operator SES, as of March 31st, was fully using 995 transponders out of a fleet total of 1249 (79.7 percent, and up 32 full transponders on the same period last year) with markets such as India filling every available transponder on its SES-7 craft. This is the reason why SES has ordered a new 33-transponder satellite (SES-8) to boost India coverage. India is proving to be a hot market for SES, where it has about 50 percent of the local DTH market. Its capacity is leased via Indias ISRO space organisation, usually on five-year contracts for DTH clients. Indias DTH demand is growing exponentially, up from 20 million at the end of 2009 to more than 32 million homes today. After successfully breaking into the playground of the commercial satellite giants, with AMOS-1, -2 and -3, the Israeli satellite industry is now moving forward with new satellites, more innovations and new target markets. On May 18, I had the privilege of testifying before the United States Senate Committee on Commerce, Science and Transportation as a third-party, unbiased expert on the Contributions of Space to National Imperatives. I was joined by Frank Slazer, vice president of space systems for the Aerospace Industries Association, Dr. Christopher F. Chyba, professor of astrophysics and international affairs and director of the Program on Science and Global Security at Princeton University, and former NASA astronaut Capt. Frank L. Culbertson, Jr., USN (Retired). Broadcasting infrastructures today must be flexible and highly efficient. Contribution quality content comes from a wide range of sources  satellite, fiber, and, more recently, Ethernet. A single feed may feature a mixture of fiber and satellite routing, and with the increasing use of IP, new complexities and challenges come to the fore. In addition to compatibility issues, mixing content formats and sources requires encoding, decoding and re-encoding, which can cause signal degradation. At the same time, rising adoption of HD, 3G and more live programming require the highest quality content. The good news? Advanced compression schemes such as JPEG 2000 provide visually lossless compression with very little degradation even after multiple encode/decode cycles. New monitoring and control capabilities in the form of integrated software solutions provide comprehensive monitoring, and control across the video transport chain ensuring quality of service. Over the last 18 months, Advantech Wireless has explored the synergistic use of the DVB-S2 and DVB-RCS to enhance both data networking and, coming full circle, IPTV solutions. Particularly satisfying was to see the U.S. Department of Defense announce, in February of 2006, that their policy for the transmission of IP of both commercial and military satellites was to use the DVB-S2, DVB-RCS and MIL-STD-188-165 standards. The Company has been successfully deploying such systems from early 2006 for commercial and defense applications. In addition, Advantech Wireless recently collaborated with Telesat Canada and the Canadian Space Agency (CSA) to demonstrate the first use of DVB-S2 in a DVB-RCS system with a satellite operating at Ka-band. (The major advantage of Ka-band from the stand point of the end user is lower service pricing, made possible as a result of the spot beams and frequency reuse in Ka-band satellite design). With iDirects new TDMA and SCPC Return switching capability, service providers gain the flexibility to adjust service levels to meet dynamic application needs and changing traffic patterns, while maintaining an economical way to use total network capacity and optimize operational efficiencies.